Beyond theory: How do we handle our projects? What are our project results? On the basis of exemplary case studies, we give you an insight into our work. Probst & Consorten Marketing-Beratung is operating all over Germany and in the neighbouring countries, especially in Austria and Switzerland. Our customers are transport companies, transport associations and public transport authorities. 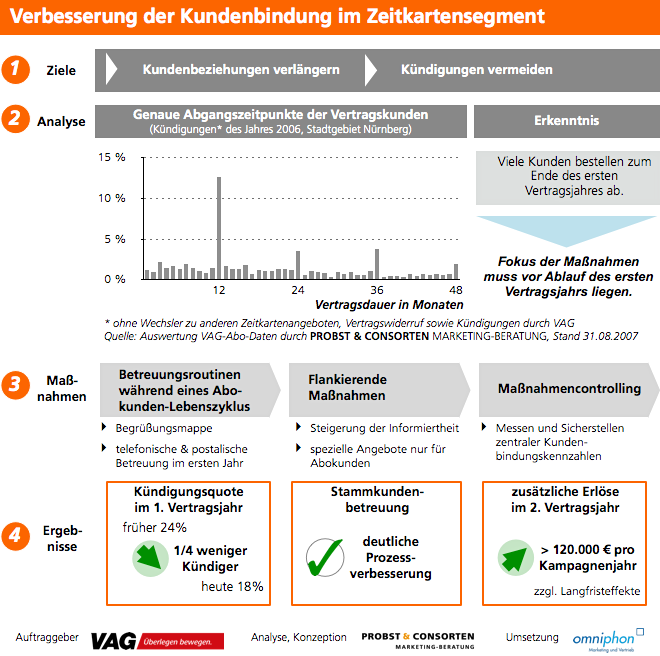 In 2007 and 2008, Probst & Consorten Marketing-Beratung designed a new CRM for regular customers on behalf of Verkehrsaktiengesellschaft Nürnberg (VAG Nuremberg). Due to the fact that many subscribers terminated after a short time, central support practices were successfully introduced. The reason for this project was a request by the Austrian region of Tirol in 2012 to create a fare product for the growing target group of senior citizens, which is easy to use. 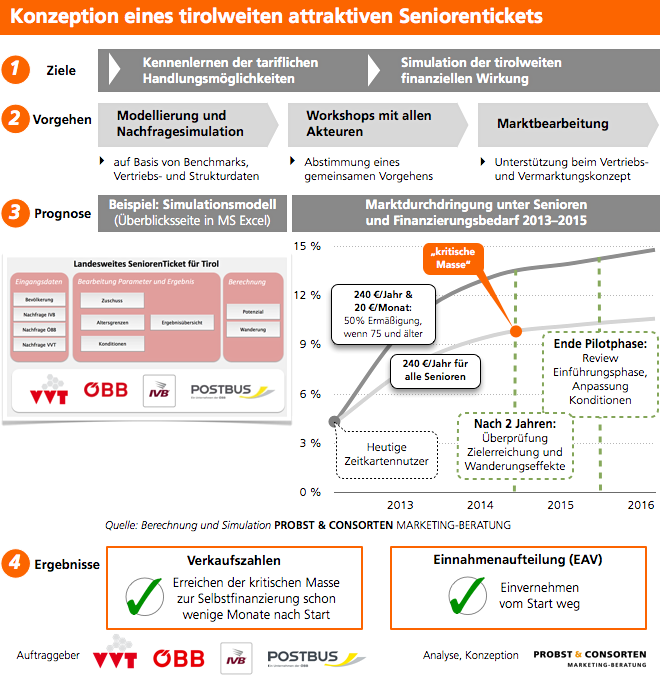 Probst & Consorten Marketing-Beratung’s aim was to develop a low-cost ticket, which at the same time provides the opportunity of a refinancing through the attraction of new customer groups without worsening the economic situation of transport companies. Along with the introduction of a new subscription product in which Probst & Consorten Marketing-Beratung was significantly involved, the principal public transport operating company in Stuttgart (Stuttgarter Straßenbahnen AG) was planning a sales campaign for its customer centres in 2011. Together with the sales consultants, Probst & Consorten Marketing-Beratung developed a training concept which it implemented in several steps. In 2010 and 2011, the Münster public utilities were intensively preparing the introduction of an electronic ticketing system for their bus network based on their "PlusCard" customer card. 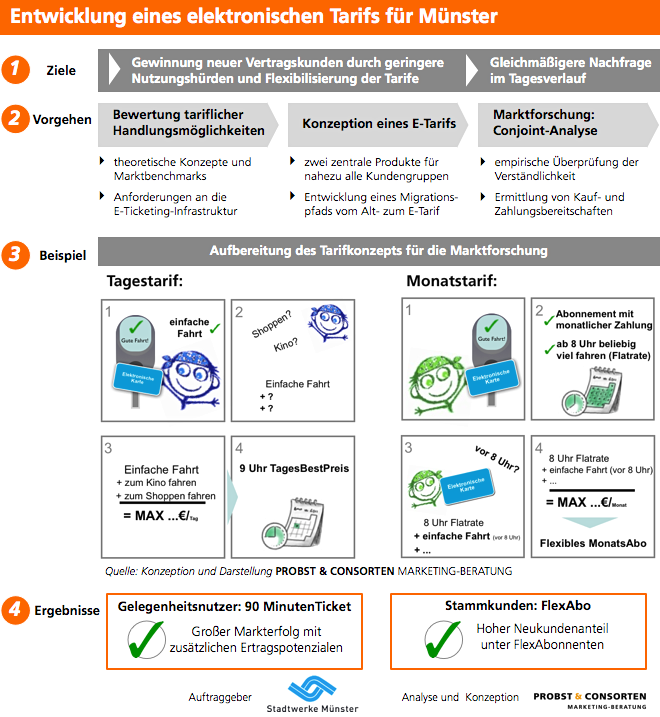 For the development of the electronic fare which was introduced in 2013, they were advised by Probst & Consorten Marketing-Beratung.